What are those two cocky Cromwells up to? Where’s the British infantry? Why did the Stuart stop? Yesterday’s turn posed more questions than it answered. Surely the fleecy fog of uncertainty currently blanketing Caent can’t survive another sixty seconds of battlefield developments. +5 seconds. The bakery-bound (?) 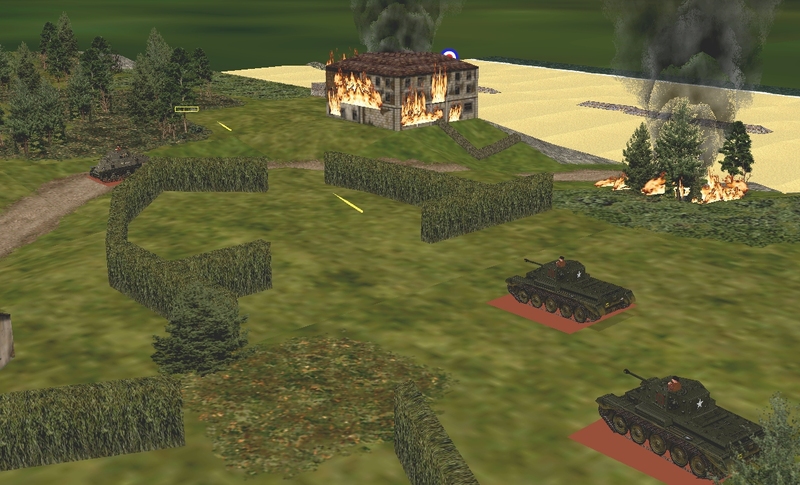 Cromwells pause and reorientate. They’ve decided to machine gun the pillbox crew cowering in the woods near the blazing sanatorium. +7 seconds. For a few moments a Churchill VII is visible on the beach. It appears to be stationary. +15 seconds. Having completed his roll-up (?) dealt with the wasp up his sleeve (?) answered – with the help of a beer bottle – the call of nature (?) the Stuart driver resumes his duties. 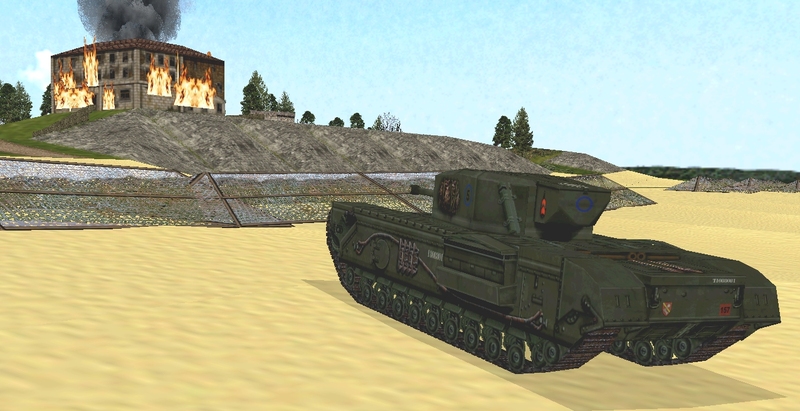 With a lurch the M3A3 continues northward down the lane. +35 seconds. Wodtke, his breath held and his Kar98K as rock-steady as one of the gargoyles adorning his eyrie, fires. 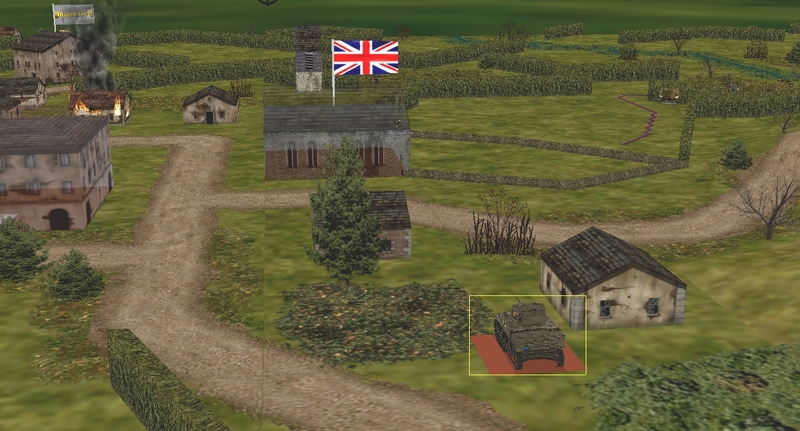 Instantly, the Stuart TC disappears from view and every gaping hatch on the Allied AFV slams shut. +46 seconds. 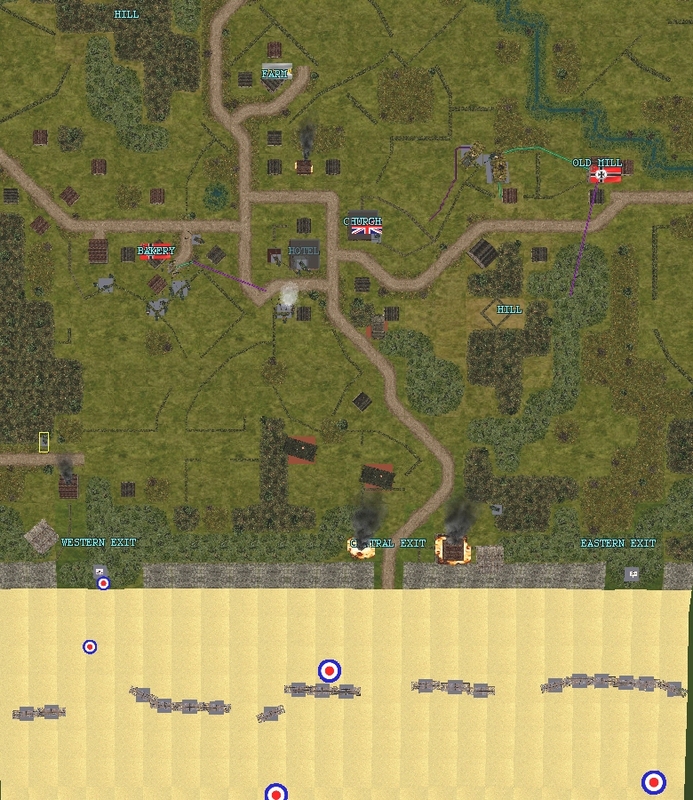 Still moving, the Stuart is briefly spotted by our PSW as it speeds towards the mill (a journey almost disrupted by the manoeuvring halftrack). +53 seconds. 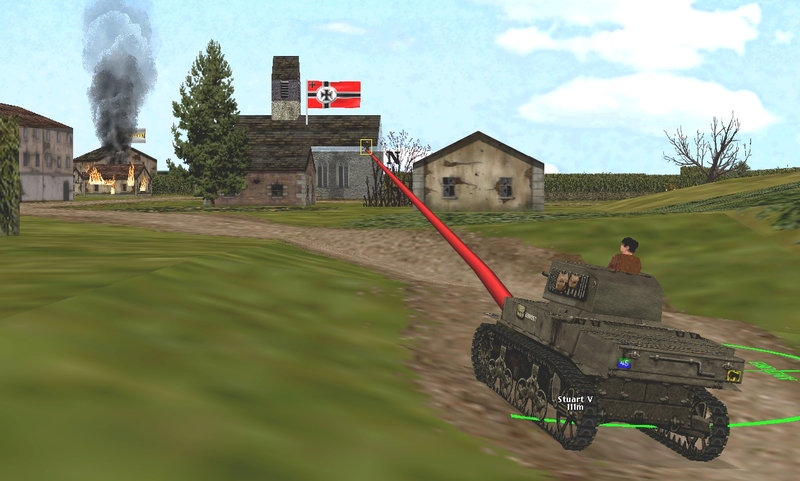 A yank on its starboard steering lever guides the British light tank into a secluded spot between the house and pine clump at m and n19. 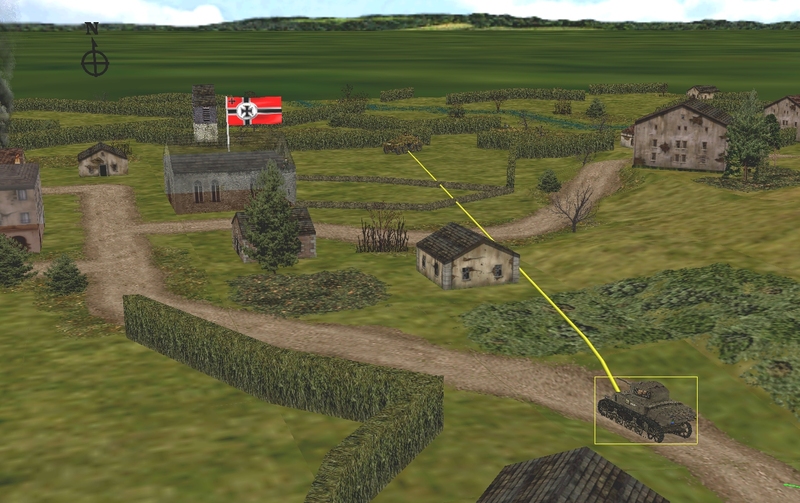 The advance strikes the German flag over the church VL and, for the first time, nudges the British score (45%) above our own (36%). +60 seconds. Hallo Herr Hetzer! 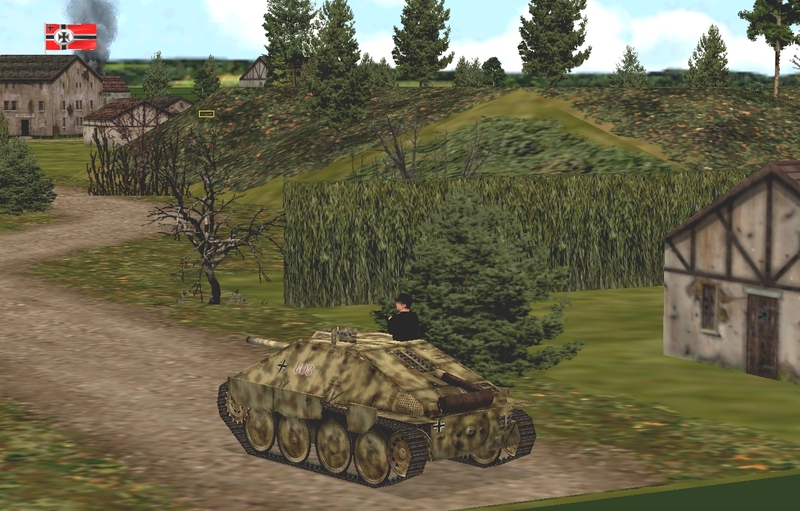 While it’s no Tiger or Panther, the squat, cunningly faceted tank destroyer that has just entered the map at i32 should be incredibly useful in the turns to come. 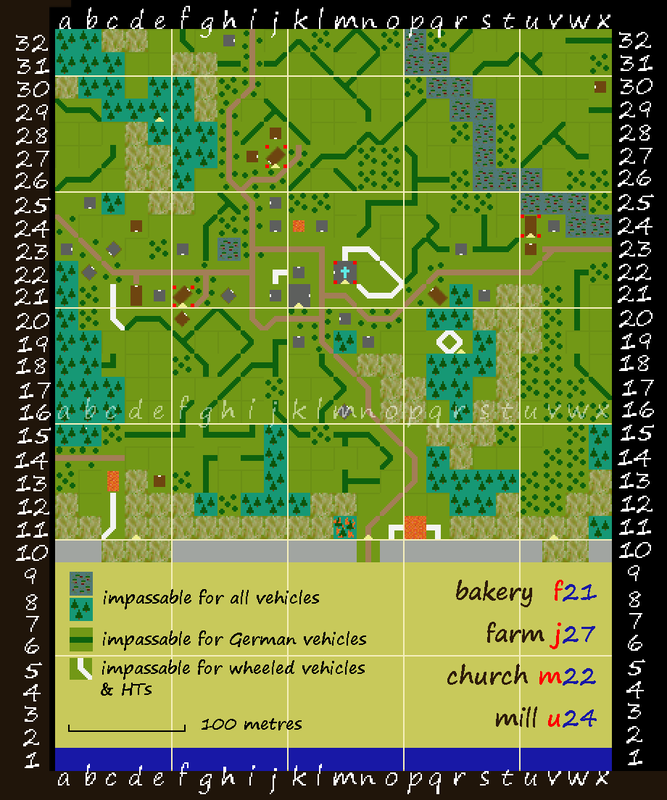 At the bakery only the Pak 38 is still moving, and there’s still no sign of enemy infantry in west wood. Though the pioneers at the hotel are close enough to the Stuart to chew on its exhaust fumes and hear its turret motor whirring, no-one can actually see the armoured interloper at present.